Do you have a favorite recipe from when you were growing up? Something that your mom, or maybe your grandma or an aunt, made that would make you run to the table? Something that brings back happy memories whenever you think about it? I do. Well actually I have many. But my favorite meal growing up was sloppy joes with macaroni and cheese. I could have eaten it every day! We got to choose what we wanted for dinner on special occasions (birthdays, good report cards, etc.) 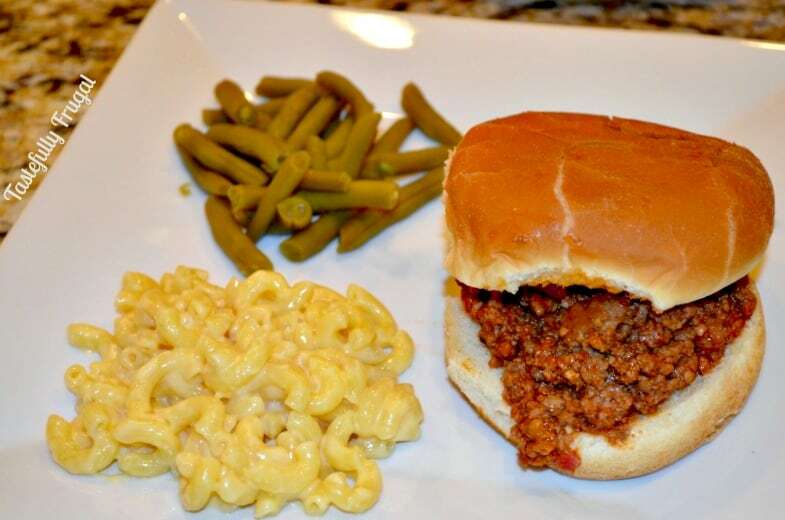 and I remember I always picked sloppy joes and macaroni and cheese. They go together like pie and ice cream. Mmmm pie… now I’m craving pie and it’s 1 o’clock in the morning. I really should get to bed. 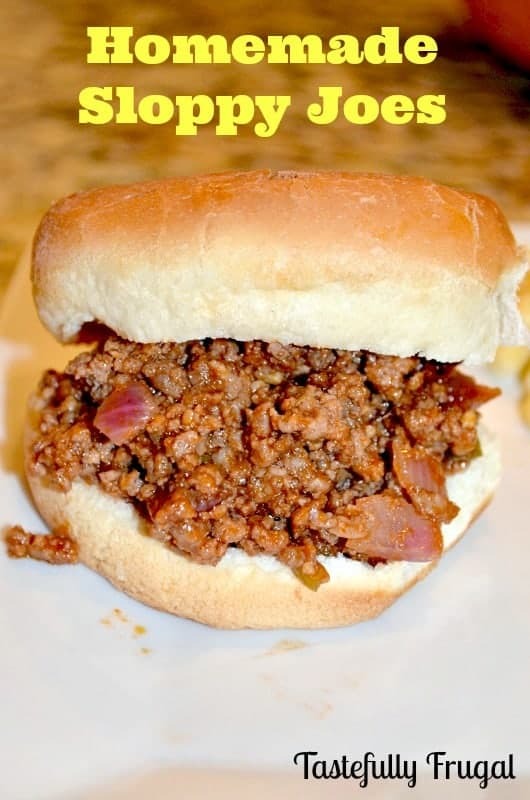 I can’t remember if my mom would make sloppy joes from scratch or just throw a little Manwich in with some beef but I loved it either way. Now that I’m a mom I want to make these same memories with my kids. Maybe they won’t love the same things I did, but I want them to look back at dinner time as they get older and think happy thoughts. If I had it my way thinking happy thoughts would keep them little forever, just like Peter Pan; but that’ll never happen. I like making things from scratch. Not only does it taste better, but I also get to control what goes in it. If you saw my Macaroni and Cheese recipe I posted earlier, you saw that I am trying to get all artificial colors and dyes out of our diets. Manwich doesn’t have any colors but it has high fructose corn syrup which I’m not a huge fan of either. This recipe is low on ingredients but high in flavor. Plus it’s an easy way to sneak veggies in without your kids knowing. 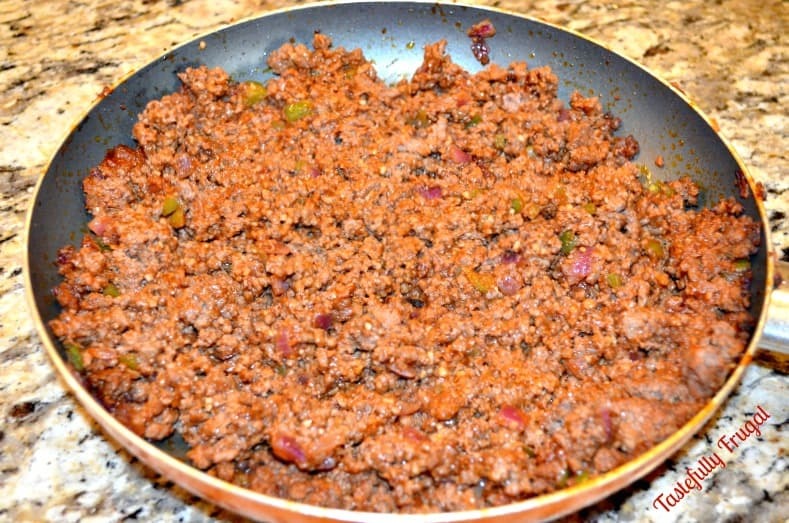 Brown ground beef with garlic, bell peppers and onions. Drain grease. Stir in ketchup, tomato sauce and Worcestershire sauce. Bring to simmer over medium heat. Reduce heat to low and simmer for 15 minutes. Serve on buns with Macaroni & Cheese (That’s a must you have to serve it with mac’n’cheese 😉 ) and a veggie. I like green beans with this. And you know what…. my boys LOVE this! When I was making my meal plans for the rest of the month Rohrl actually said “Mama can we have Slappy Joes pease” I love that he calls them Slappy. And yes I am making them again this week… they are just that good. Hope you are having a great week and don’t miss tomorrow’s Friday Pie Day. Especially if you liked this recipe! Oh yum! I haven’t thought about Sloppy Joes in forever! Good hearty American food. Thanks Audrey! I think they are great American food too! !